You don't have to be a runner to enter the Vancouver Sun Run. You can stroll, stride or power-walk the 10K course instead. Take the challenge in stride! You don’t have to be a runner to enter the Vancouver Sun Run. You can stroll, stride or power-walk the 10K course instead. 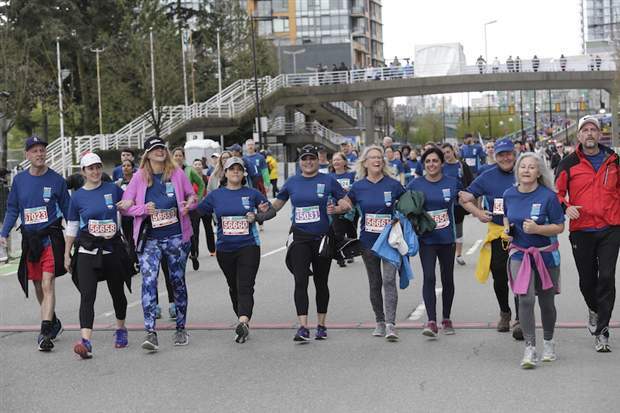 Over one third of Vancouver Sun Run participants are walkers! Walkers have their own start zone (1:46+) and are the last wave to cross the start line at approximately 9:30 to 9:45 a.m. You are encouraged to arrive at the start by 9 a.m. to ensure that you can access your start zone and partake in all the pre-race festivities. Remember several streets in the downtown core will be closed and this may add delays to your traveling time if you leave later in the morning. Bring water and stay warm. Dress with layered clothing to ensure you stay warm while waiting for your wave to start but ensure you remove your clothing to expose your race bib before your cross that start line to ensure your timing chip is activated. Port-a-Potties are stationed on Hornby Street for your convenience and comfort. The Walker’s Zone gear check is located on Howe Street and will remain open until 9:30 a.m. Remember there’s no need to sneak into a faster start zone. With the timing system, your time begins when YOU cross the start line. Bands at the start area will entertain you until the last walker leaves. Boost your energy level! Fuel up with fruit and water at your very own Walkers Pit Stop (located between the 3K and 4K mark) to help you get to the finish line.